Microsoft has pulled Your Phone – an app that let Android users connect their phones to Windows 10 PCs – just one day after its global release. 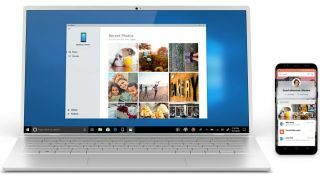 After a brief testing period with Windows Insiders, Microsoft made the app available to all Windows 10 users yesterday. However, it seems this was premature. Vishnu Nath, head of program management at Microsoft Mobility, announced the decision on Twitter, saying that it wasn't quite ready yet. Lead program manager Roberto Bojorquez clarified the situation further, explaining that the app was meant to still be in testing. You'll be able to keep using the app if you installed it yesterday, but new users won't be able to grab it without first joining the Windows Insider Program. As we noted yesterday, it was surprising that Your Phone launched without many of the features that Microsoft demonstrated at Build 2018, including the ability to send and receive text messages via the desktop, and receive Android push notifications in Windows. Hopefully these tools will be included when Your Phone is released for real – possibly with the Windows 10 Redstone 5 update later this year.